Substitute green tobiko for roe of other colors. Green tobiko, the eggs of flying fish roe, in sushi (a gunkan maki—photo courtesy Toria Sushi. 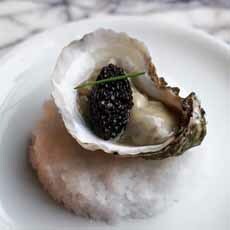 Oyster with caviar (photo courtesy Rebelle NYC). 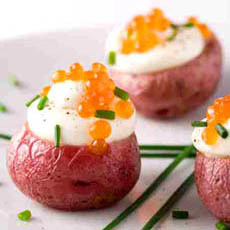 Caviar potato bites; the same concept works with potato chips and cucumber slices (photo Fotolia). Top grilled fish (photo courtesy FishStar). 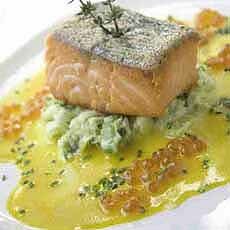 In a simple butter sauce (photo KN Studios | Fotolia). Ready for some culinary adventure on St. Patrick’s Day? We look forward to our annual green bagel and corned beef and cabbage, but needed to find something green for hors d’oeuvre and a first course (not guacamole, not spinach dip, not green bean salad, but something special). 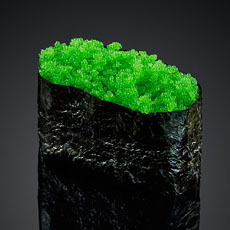 Browsing through the market, we came across a large jar of green tobiko caviar and began to play with it. Tobiko (flying fish roe) is a popular sushi ingredient, as both a garnish and in a gunkan-maki or “battleship roll” (photo #1). 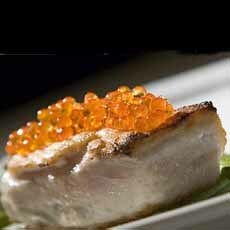 The roe, or caviar*, if you will, comes from the flying fish of Iceland and the Pacific Ocean. Naturally orange in color with a delicate nutty taste (no fish flavor), it has eye appeal and a crunchy texture. Over the past 20 years, the roe has been colored black, gold, green or red—for colorful garnishes beyond the sushi bar. It can also be flavored; for example, spicy orange tobiko, green wasabi-flavored tobiko, yellow citrus- ginger-and yuzu-flavored tobiko and pale red ume (plum) tobiko. We’ve even had brown truffle tobiko! So garnish we will! Here’s what we came up with for green tobiko with everyday dishes, nothing haute cuisine. On a bagel and cream cheese, with or without the smoked salmon. On potato chips, a dab of sour cream or crème fraîche; or on cucumber slices. Baby potatoes (cut in half, top with sour cream and garnish with tobiko—photo #3). On eggs and deviled eggs. On fish and seafood, from a plain grilled filet to ceviche and shrimp cocktail. Caviar Martini (small Martini glass layered with guacamole, sour cream, and tobiko on top). Oysters on the half shell (photo #2). On scallops or fish fillets (photo #4). On mashed potatoes (you can garnish or mix it in). Baked potatoes and sour cream, even chives. Even if you’re a sushi bar habitué, you may not know that there’s a difference between masago and tobiko. Both are small beads of roe, both are naturally orange in color. They are the roe of different fish: capelin for the masago, and flying fish for tobiko. Tobiko has larger eggs. We find them to be ore flavorful and crunchy, and the eggs are larger. Tobiko is the roe that is most often colored (green, red, yellow, etc.) and flavored.